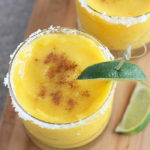 Frozen mango margarita recipe is sweet and refreshing. Frozen mango chunks and combined with orange juice, fresh lime juice and orange liquor, then garnished with a sprinkle of warm cinnamon. Combine all ingredients except the cinnamon in a blender. Process until smooth. Pour frozen margaritas in a salted glass. Garnish with a sprinkle of cinnamon, if desired.